Beading Arts: Book review and giveaway: Make It Sparkle! Lindsay Burke's favorite techniques are creating sparkling clusters of crystals and making designs with graduated crystal colors. And how she loves loves loves crystals! The 25 designs taught in this new book published by Interweave, Make It Sparkle, use many techniques, but have one thing in common...her beloved crystals. All of the projects, designed by Lindsay and four friends, can be done step-by-step as her excellent instructions show, or they can be customized and personalized with your own choices of bead shapes, colors, and metals. This is a great beginner's project book, with all the tools, materials, and techniques clearly defined. 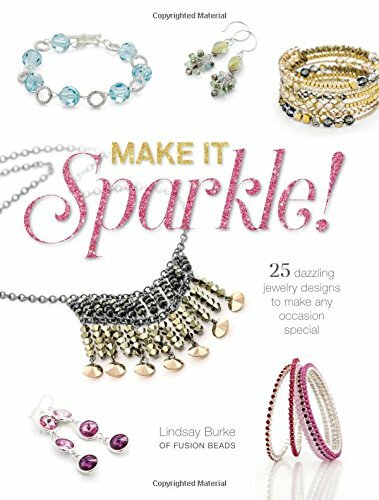 If you've never made jewelry before and want to try a variety of wire, chain, and crystal projects, this could be your book. You'll end up with a sparkling selection of necklaces, earrings, and bracelets! Would love to have book. You can never have to many crystals...that would be an awesome book for my crystal collection. This book looks like it would be fun to jump right in and start on a project. Would Love this book! I bead ornament covers but would love to try something new!